One rising college senior from each state is selected by The Henry Clay Center for Statesmanship to participate in the College Student Congress. 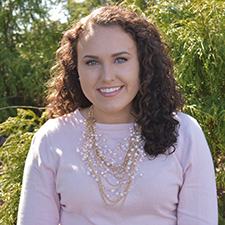 Madison Paige Powell, a political science major from Lawrenceburg, will represent Kentucky during the May event. Powell said she believes the experience serve as good personal development, while also developing her potential to be a global leader. Powell also said she thinks the experience will provide training for her future endeavors in public law. According to The Henry Clay Center for Statesmanship website, the College Student Congress gathers 50 students together with lawmakers, academics, politicians, journalists and business leaders to learn about the dynamics of public policy and public policy decision-making through the lens of the legacy of Kentucky statesman and compromiser, Henry Clay. Students will focus on different dimensions of four unique policy challenges currently facing the country. Previous topics have included health care, net neutrality, national security, immigration, transportation and national debt. Students participate in intensive curriculum and project designed by the University of Kentucky Martin School of Public Policy and Administration and the Henry Clay Center staff. Afterward, students will have the opportunity to travel to Washington D.C. to take what they’ve learned about public policy and see it in action. As part of the program, the Henry Clay Center assists students by cultivating summer internship opportunities across government and the private sector in the Washington D.C. area. Powell said she was encouraged to apply by Dr. Charles Holloway, assistant vice president for student success, and Kentucky State University President M. Christopher Brown II. Powell is extremely active at Kentucky State, serving as president of the Whitney M. Young Honors Student Council, a member of KSU Girls Rock, Student Government Association junior class vice president, former president and current vice president of the Pre-Law Society, member of the Honda Campus All-Stars quiz bowl team and many other organizations. The College Student Congress takes place May 13-24. For more information about the College Student Congress, visit henryclaycenter.org.